The First Gift – Cord Blood | Southern Illinois Ob-Gyn Associates, S.C. The process is safe, painless, easy and FREE. Your physician or midwife collects the cord blood after your baby has delivered, so it does not interfere with the birthing process. The collection will not take place if there is a concern for your safety or that of your baby. Your free donation will be part of a program that is saving lies and supporting research to discover new uses for cord blood stem cells. Units that meet criteria for storage are made available to anyone, anywhere in the world, who needs a stem cell transplant. Join the thousands of families who have donated their babies’ cord blood. Help save the lives of people with any one of 80 life-threatening diseases. Your donation is important because cord blood is needed for people of all racial and ethnic backgrounds. Cord Blood Donation is free and easy, safe and painless, and most importantly, you could save someone’s life! Granton Bayless was diagnosed with severe combined immunodeficiency syndrome (SCIDS) in 2008. He required a stem cell transplant. Because neither of the parents was a suitable match, cord blood was used for a transplant in June of 2008. Six-month-old Granton Bayless was taken to the emergency department in Coffeyville, Kansas in March, 2008. He was diagnosed with respiratory syncytial virus (RSV) and bilateral pneumonia. The following day, he was flown to St. John’s Hospital in Springfield, MO. However, his condition worsened, so five days later, he was sent to Children’s Mercy Hospital in Kansas City, MO. His pneumonia and RSV had become so severe that his lungs had become perforated. 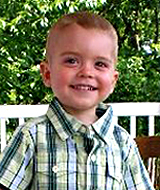 Granton was placed on a ventilator with tubes in his chest to suction the air leaking from his lungs. He was also medically paralyzed to prevent injury from the tubes and sensors attached to him, and also to conserve energy and oxygen. Granton was diagnosed with severe combined immunodeficiency syndrome (SCIDS), a rare condition that prevents the patient’s body from producing enough T cells to resist disease. Successful treatment required a stem cell transplant, but neither of the parents was a suitable match. An unrelated donor was found for both a bone-marrow or a cord blood match. However, there was concern that the bone marrow stem cells might attack the virus too aggressively, and make Granton’s lung condition worse. Cord blood stems cells, on the other hand, would slowly attack the virus. So, cord blood was chosen for transplant. The transplant was performed in June and Granton went home in September. He is doing well as of this writing. The cord blood unit that saved this child’s life was collected by one of the St. Louis Cord Blood Bank’s participating physicians and midwives, and was stored in our facility since 2000. Granton Bayless is alive today because of the generous contributions of time and effort by all the doctors, midwives, and nurses who collect cord blood for the St. Louis Cord Blood Bank.